Spring's coming fast. 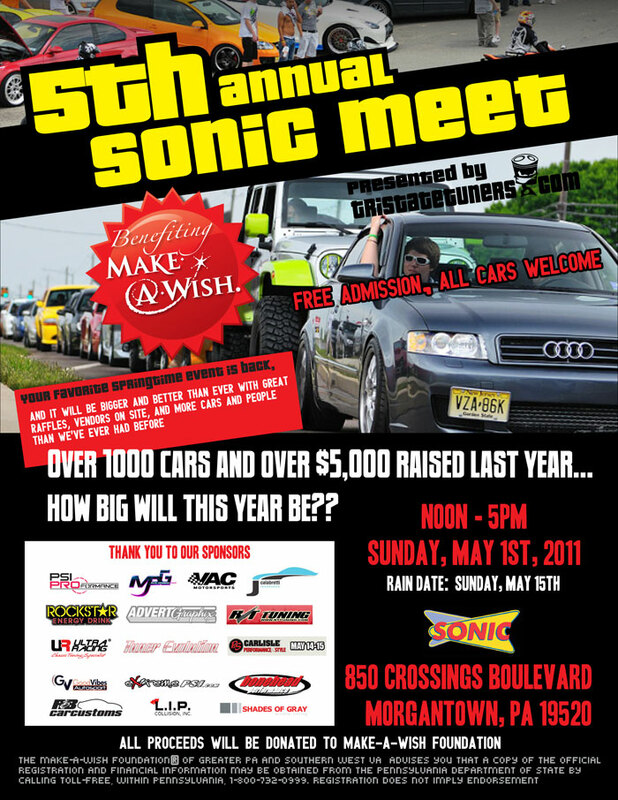 What better way to celebrate than the TST Sonic Meet. Let's make this the best Sonic Meet Ever. -Please bring a two way radio or make sure i have your cell phone number. -Don't plan on racing the entire way to Sonic, street racing is illegal and frowned upon. -Don't drive like a complete idiot, the point of this is to get to sonic in a big group. -Please ensure your car is able to make the hour trip. We will not pull over and repair your car on the side of the road for you. That is why you have AAA. -We will not be stopping to get gas. Any other questions about the meet up/caravan, PM boostinsidewayz, as he is organizing the actual cruise itself. Here is the link to the Official Sonic Meet Thread with more information & directions. Attending: - PM or comment, and i'll update the list. Last edited by liberta; 04-28-2011 at 10:38 PM. yo liberta u can put me down on the list just in case the civics up nd running in time. A thread for a south NJ caravan over there? If so, please link. If not, add me to this list. I probably won't have a 2 way radio, but I'll get you my cell # just in case. And if I break down, I got AAA. Thread updated. Linked over to steve's thread, linked to the main thread, and updated list. Sounds good turbotaloon. Steve(boostinsidewayz) doesn't have any information in his thread yet... im still leading him in charge of the actual caravan. I just made the thread with all the info. Count me in,possibly a few guests. Anyway. I just wanted to man up and apologize for what I did. I was a complete @$$hole. I talked to John today, and told him I was WAY out of line. He and you guys had every right to be mad at me, and what I did/said. Truth be told, I feel really bad about it; as I should. Again man, im sorry for what I said. Just uncalled for, and plain out wrong. I didn't see you there last year steve. Were you in the wagon or the pontiac? I was in my fiancé's silver mustang gt with black stripes. You taking the turbo saturn this year? Well i got it running on the MS2 last night (at least idling and able to cruise around out of boost) so as long as it doesn't blow up within two months, yes! Put me down for a maybe - Might bring another 4-5 sentras. Any other DSMs coming on this caravan? Ill probably be there. Everything is currently running smoothly with no leaks . Last thing I need is a new mbc, ill be able to go over 10 lbs. i am gonna try and shoot for this, it will be my first and i will be driving my gsx i hope... Anyone got a turbo layin around hahaha. Got a 14b with tons of shaft play if interested! Haha. How bout a 60-1? Came off of a 1G DSM on like 30psi.